No, think not. I’m the real deal. I’ve been training Elves with the SPG-E2 for two amazing years! The South Pole Group – Entry and Escape, specialized in contained structures and escape. SPG-E2 deals with all the housing units that don’t have chimney access or common access, such as hotels; apartment buildings; condominiums; and airports. They also specialize in escapes. Yeah, South Pole. The guys at the North Pole do Christmas functions and toy making. The boring stuff – even though it’s what everyone looks forward to. You have to have seen the movies where the elves had technology and were conducting missions???? That’s the South Pole Group! I train those guys. 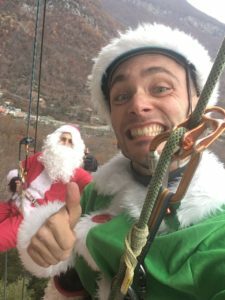 And this year I was lucky enough to be asked to return to Chimney Rock State Park to accompany Santa himself in a rappelling exercise to build Christmas spirit and practice Chimney entry with Santa! Fox Mountain Guides was kind enough to provide us with some non-magical climbing equipment to train with. They also gave me a couple coupons redeemable for climbing with one of their outstanding guides. 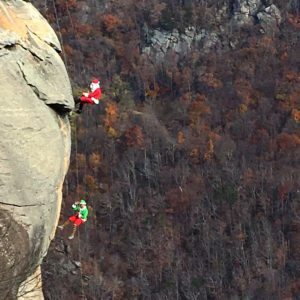 We will be giving those away this upcoming December 10th 2016 at Chimney Rock State Park!